I went hunting for an impressive oak tree to photograph and found this one along a stretch of highway south of Daisy, Georgia. It is impressive. My purpose for the quest was to illustrate one aspect of faith: “for we walk by faith, not by sight.” 2nd Corinthians 5:7 ESV. I don’t think this oak came about from a squirrel dropped acorn. I think someone planted this tree a century or more in the past. I have no proof of that, so that’s just a deduction from the other oaks up and down the road that appear to have been placed in particular locations. There probably was a house here then, but it probably wasn’t this one. (Could have been remodeled through the years, though). The tree wouldn’t have become impressive during the lifetime of its planter. It’s likely it didn’t even reach “noticeable” status. And, it’s an absolute that the planter is not still around to see it become this mighty tree. But, that didn’t matter – they walked by faith. They knew what would happen far in the future. Their small efforts would become established and grow into a massive tree that would provide food and shelter for animals, and shade and comfort to people. I don’t know if they had the thought that just the sight of the tree would give a sense of wonder at God’s Creation, but I know that’s what I felt as I came around the curve and saw it. It is just a deduction that someone planted this tree many years ago but the concept stands. Anytime you plant a long-lived, slow growing tree, you probably won’t see it reach “impressive” size. But, somebody will. And that’s where I think another aspect of “walk by faith” comes in. It’s not planting trees (although I consider that a good thing), it’s doing things to please the Lord, even though we may not see the results (perhaps not even in our lifetime). As Jesus told us: Give someone who is thirsty a drink of water in His name. Feed the hungry. Welcome the strangers. Visit the sick. Make disciples. Got faith? Then walk in it. Plant an oak tree. Or, better yet, spread the Good News about Jesus Christ, our Lord and Savior. 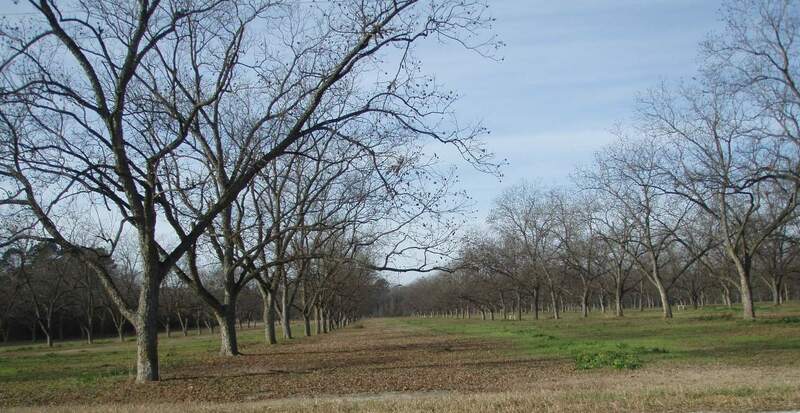 Here’s a lifeless orchard of pecan trees a few miles from our house. You can tell it’s lifeless because there are no outward appearances of life. There are a few husks from the nuts that are still on the tree but very little fruit is there. Perhaps, though, it’s not dead but could just be hibernating. Everything has shut down and nothing’s happening. Nothing is outwardly apparent. But, we know, that there is a lot happening out of our sight. The roots are growing and flexing their muscles – spreading into new areas and strengthening their grip on the earth. They’re getting ready for the right time – when it’s time for them to help push out the sprouting leaves and start the fruit of the next season. We, too, can have seasons that appear lifeless, when there’s not much happening outwardly. We could spend time in hibernation and shut down. 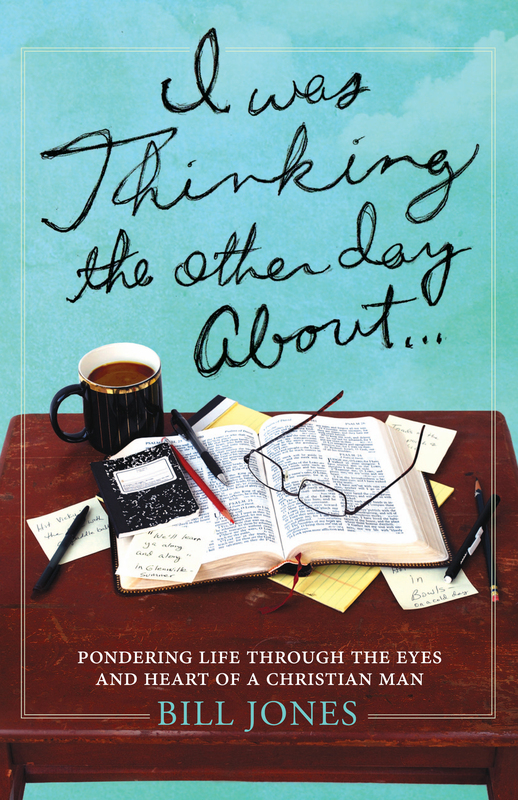 But, even in those quiet, seemingly slow times, we need to be strengthening our roots – by prayer and meditation, by study in God’s Word – flexing our faith muscles and getting ready for the next opportunity that God will give us to serve Him. Want a sure sign that Spring is here? 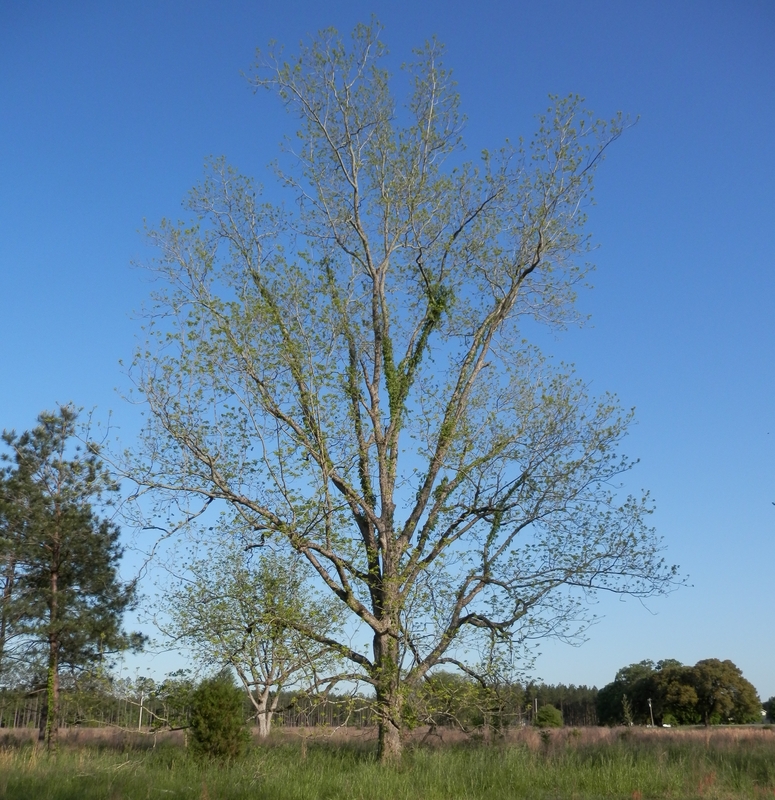 Then, look for the budding pecan trees. They seem to be the last large trees around here (south Georgia) that bud out. Want a sure sign of faith? Then look for the huge pecan trees and oak trees around the homesteads in the country. I don’t know how old this tree is, but it’s on the edge of our property and has obviously been there many years. And I do know that whoever planted it is not around to enjoy the fruits of their labor. But, they had the faith to plant it anyway. That’s even more evident with slow growing live oaks. 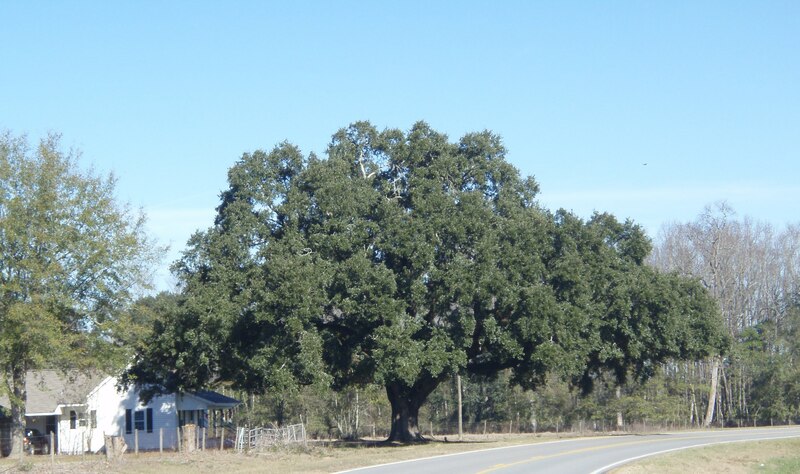 You can see one oak tree large enough to shade an entire house. Yet, the planters knew they wouldn’t be around when the tree reached that point. Again, they had the faith to plant it anyway – not necessarily for themselves but for generations to come. Hebrews Chapter 11 is sometimes called the “faith” chapter because it speaks of the faith of a number of saints from Biblical times. Their acts exceeded the simple planting of a tree, but the concepts can be compared. Much of what we do, in faith today, will not have an effect until sometime in the future – whether it be tomorrow, next week, next year – or in a lifetime following ours. Chapter 12 refers to these witnesses (showing faith) and gives us instructions on how to join them as witnesses for the future generations. 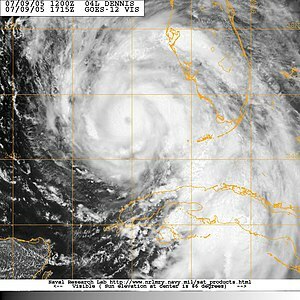 Tropical Storm Debby passed close enough to our area this week to be a reminder that hurricane season is here. It was interesting that early in the process the various computer-forecasting models didn’t agree. Some predicted the storm would head west to Texas, some said it would hit Florida, and one had it wobbling around in a loop in the northern Gulf of Mexico. That reminded me of a television show about hurricane forecasting. In one segment, a forecaster described the process of recommending when, where and to what level to have coastal evacuations when a hurricane approaches. The uncertainty of the path (especially if the models disagree), and varying strength of the storm several days out, can make it difficult to determine what to do. Waiting too long may not leave enough time for the people to leave and can be disastrous. It can have that same result if a weak storm suddenly jumps up a couple of categories in strength just before it hits land. Calling for an evacuation only to have the hurricane go elsewhere or fizzle out makes for unnecessary disruption, costs money and leaves many frustrated and angry people. It also increases the tendency to disregard the next call for evacuation – which may be the storm that does hit at full force. With all that variability, what did he say they strive for? That sounds like no matter which choice they make there will be some regret. Even if an evacuation is called and the storm hits as predicted, there are probably still some thoughts that it should have been a smaller (or larger) evacuation. On the other side, it’s clear that not calling an evacuation and having a strong storm hit an area is the worst possible outcome with much regret. As Christians, we also make choices on the paths we take. Hopefully, we don’t use the “least regret” philosophy, but strive to follow God’s path for our lives. (“Show me your ways, O Lord; Teach me your paths.” Psalms 25:4 NKJV). That doesn’t mean God’s path for us will always be straight and easy. In some ways, it may be harder than taking our own path – but choosing our own path is guaranteed to have regrets. “I will bring the blind by a way they did not know; I will lead them in paths they have not known. I will make darkness light before them, And crooked places straight. These things I will do for them, And not forsake them.” Isaiah 42:16 NKJV.